This article was written by Matthew Hole, from the Australian National University and Igor Bray, from Curtin University, and was originally published by The Conversation. It's part of their worldwide series on the Future of Nuclear, and you can read the rest of the series here. Nuclear fusion is what powers the Sun and the stars - unleashing huge amounts of energy through the binding together of light elements such as hydrogen and helium. If fusion power were harnessed directly on Earth, it could produce inexhaustible clean power, using seawater as the main fuel, with no greenhouse gas emissions, no proliferation risk, and no risk of catastrophic accidents. Radioactive waste is very low level and indirect, arising from neutron activation of the power plant core. With current technology, a fusion power plant could be completely recycled within 100 years of shutdown. Today’s nuclear power plants exploit nuclear fission - the splitting of atomic nuclei of heavy elements such as uranium, thorium, and plutonium into lighter 'daughter' nuclei. This process, which happens spontaneously in unstable elements, can be harnessed to generate electricity, but it also generates long-lived radioactive waste. Why aren’t we using safe, clean nuclear fusion power yet? Despite significant progress in fusion research, why do we physicists treat unfounded claims of "breakthroughs" with scepticism? The short answer is that is it very difficult to achieve the conditions that sustain the reaction. But if the experiments under construction now are successful, we can be optimistic that nuclear fusion power can be a reality within a generation. Unlike fission, nuclei do not spontaneously undergo fusion: atomic nuclei are positively charged and must overcome their huge electrostatic repulsion before they can get close enough together that the strong nuclear force, which binds nuclei together, can kick in. In nature, the immense gravitational force of stars is strong enough that the temperature, density and volume of the star’s core is enough for atomic nuclei to fuse through 'quantum tunnelling' of this electrostatic barrier. In the laboratory, quantum tunnelling rates are far too low, and so the barrier can only be overcome by making the fuel nuclei incredibly hot - six to seven times hotter than the Sun’s core. 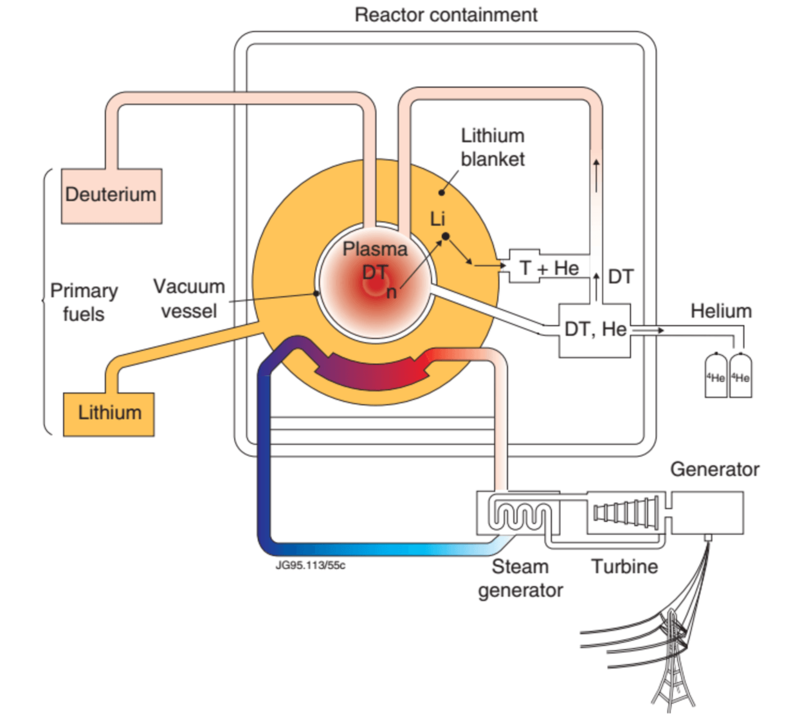 Even the easiest fusion reaction to initiate - the combination of the hydrogen isotopes deuterium and tritium, to form helium and an energetic neutron - requires a temperature of about 120 million degrees Celsius. At such extreme temperatures, the fuel atoms are ruptured into their component electrons and nuclei, forming a superheated plasma. Keeping this plasma in one place long enough for the nuclei to fuse together is no mean feat. In the laboratory, the plasma is confined using strong magnetic fields, generated by coils of electrical superconductors which create a donut-shaped 'magnetic bottle' in which the plasma is trapped. Today’s plasma experiments such as the Joint European Torus can confine plasmas at the required temperatures for net power gain, but the plasma density and energy confinement time (a measure of the cooling time of the plasma) are too low to for the plasma to be self-heated. But progress is being made - today’s experiments have fusion performance 1,000 times better, in terms of temperature, plasma density and confinement time, than the experiments of 40 years ago. And we already have a fair idea of how to move things to the next step. The ITER reactor, now under construction at Cadarache in the south of France, will explore the 'burning plasma regime', where the plasma heating from the confined products of fusion reaction exceeds the external heating power. The total power gain for ITER will be more than five times the external heating power in near-continuous operation, and will approach 10-30 times for short durations. At a cost exceeding US$20 billion, and funded by a consortium of seven nations and alliances, ITER is the largest science project on the planet. Its purpose is to demonstrate the scientific and technological feasibility of using fusion power for peaceful purposes such as electricity generation. The engineering and physical challenge is immense. ITER will have a magnetic field strength of 5 Tesla (100,000 times the Earth’s magnetic field) and a device radius of 6 metres, confining 840 cubic metres of plasma (one-third of an Olympic swimming pool). It will weigh 23,000 tonnes and contain 100,000 km of niobium tin superconducting strands. Niobium tin is superconducting at 4.5K (about minus 269 degrees Celsius), and so the entire machine will be immersed in a refrigerator cooled by liquid helium to keep the superconducting strands just a few degrees above absolute zero. 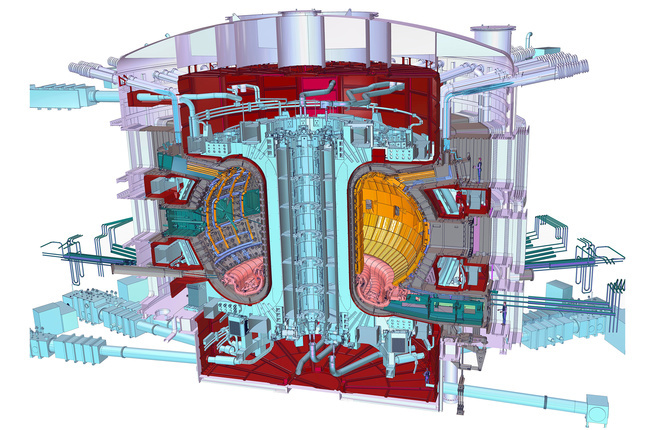 ITER is expected to start generating its first plasmas in 2020. But the burning plasma experiments aren’t set to begin until 2027. One of the huge challenges will be to see whether these self-sustaining plasmas can indeed be created and maintained without damaging the plasma facing wall or the high heat flux 'divertor' target. The information we get from building and operating ITER will inform the design of future fusion power plants, with an ultimate aim of making the technology work for commercial power generation. At the moment it seems likely that the first prototype power plants will be built in the 2030s, and would probably generate around 1 gigawatt of electricity. While first-generation power plants will probably be on a similarly large scale to ITER, it is hoped that improvement in magnetic confinement and control will lead to more compact later generation power plants. Likewise, power plants will cost less than ITER: long-term modelling which extrapolates to power plants suggest fusion could be economic with low impact on the environment. So while the challenges to nuclear fusion are big, the pay-off will be huge. All we have to do is get it to work. Matthew Hole is Senior Research Fellow, Plasma Research Laboratory at Australian National University. Igor Bray is Head of Physics, Astronomy and Medical Radiation Sciences at Curtin University.